Fire, smoke, and water can leave items tarnished and discolored. Getting your home, office, or building back in order can be consuming. Greenwich Metal Finishing is highly experienced in working directly with restoration and insurance companies, as well as with individual homeowners. We offer complete metal and crystal restoration services – all performed on-premise in our Stamford, Connecticut facility. Greenwich Metal Finishing can restore heirloom pieces, crystal chandeliers, prized metal items, and hardware to gleaming condition. For items that are damaged beyond repair, we offer custom duplication through our in-house custom fabrication department. As a certified Underwriters Laboratories (UL) facility, we excel at inspecting, restoring, and labeling lighting fixtures. 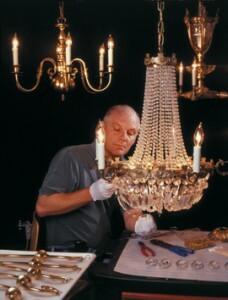 In addition to metal repair and polishing, we can also replace or fabricate any missing or broken crystal and glass in chandeliers and sconces. For a free estimate, email Greenwich Metal Finishing a digital photo along with dimensions. Pickup and delivery services are available within Fairfield, Westchester, and Putnam counties, New York City, Northern New Jersey, and Long Island. If you are outside our local area, we can arrange for professional crating and transportation.